I enjoy environment specific figures. Not just in GI Joe, but in all the toy lines I’ve collected over the years. I’ve even bought a few from lines I don’t collect. For instance, whenever there’s a new Batman toy series, I always check through the pegs to see if there’s an arctic or desert figure this time around. Yes, it’s an odd fascination. It shouldn’t be a surprise that in the various Joe lines, the cold weather figures have been among my favorites. The years between the end of the Real American Hero line and the relaunch in 2002 produced repaints of all sorts. I wasn’t all that impressed with the selections of the 2000 releases upon first glance, but I did eventually pick up the entire series. The arctic pack, however, was the first one I grabbed, for two reasons. First, it included the Snow Job mold, which was comically renamed Whiteout–whose function must have been to cover up the team’s mistakes. Regardless of name, that mold was one of my childhood favorites. The pack also included Big Ben in a new cold weather deco. The Big Ben mold is one of the members of the great 1991 series. He’s perfectly suited to be repainted in cold weather gear. His uniform is appropriately bulky, and he’s even wearing a fur hat. The man listened to his mother when he was a child, as he’s positively bundled up. This is one SAS agent who won’t be catching his death of cold. The paint job isn’t just stark white, but has a paint wipe effect that lends some variation to the look. I don’t usually prefer this sort of paint job on Joe figures, but in this case it’s subtle enough not to bother me. And since the white is already a little dirty looking, we don’t have to worry about the plastic yellowing too much. A nice extra that almost goes unnoticed is the patch on the right arm. Both figures in the set have it, and though the patch is probably meant to stand for Arctic Team, I like to think maybe it’s a nod to the Adventure Team of old. Strangely, this release of Big Ben left out one accessory–the bipod for his machine gun. This is a great mold and perfect repaint. Really it should be loved by collectors. But has hasbro packed it 4 per case and it was the greatest peg warmer of his era. That pretty much doomed the figure. Too bad. Big Ben is one of my favorite figures from the legendary year that was 1991. Probably among the best foreign Joes ever. It’s also proved useful as a retool for other beloved characters such as Shrage and an updated ’82 Rock ‘N Roll. I like environment specific figures as well and Big Ben fits in nicely here. 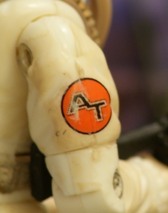 I don’t have the figure so I didn’t know about the patch but that is an awesome touch on Hasbro’s part. some places in continental North America, Whiteout and Big Ben are still pegwarming. It’s a solid figure, but I don’t like the paint wipes on this one. 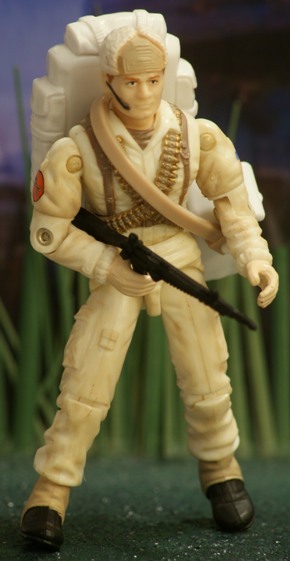 He and that Whiteout are the only two figures in the line that look like this. I prefer more uniformity among the cold weather troops. Seems like these two would be sent back to barracks to wash their uniforms. The cold guys were the pegwarmers? Heh.